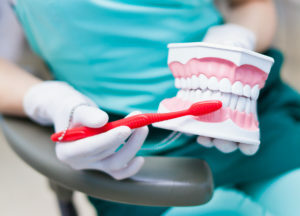 While certain types of dentistry do fall under your health insurance plan (like those involving hospitalization or sedation depending on your coverage) the rest of your dental work may not be covered unless it’s medically necessary or due to an injury, maybe like a traumatic mouth-altering automobile accident. How can you know what’s covered or what isn’t? Here’s a helpful way to think about it: the dental care that’s covered by dental insurance is directed more towards preventive care like a dental cleaning and exams to avoid oral health issues. Medical insurance is geared towards handling concerns as they arise. A toothache may cause you a lot of pain and sleepless nights, but unfortunately, your medical insurance doesn’t take those instances into account. Instead, you need to rely on your dental coverage to help you reduce the cost of your dental work—in most cases your dental coverage will cover a large portion. Plus, your dental office may have financial options to help you with the rest of the out of pocket costs. Many people may find dental insurance unnecessary, especially if they already pay large amounts for their medical coverage. This simply isn’t true. Since dental insurance is geared towards preventing problems, using your dental benefits to completely cover your preventive care appointments can save you lots of money in the long run. Besides, keeping your mouth healthy will keep your whole body healthy. When you and your dentist work together to make sure that your mouth is free of tooth decay, gum disease, and other concerns, you stay further away from heart disease, diabetes, and even strokes! A toothache may cause you a lot of pain and sleepless nights, but unfortunately, your medical insurance doesn’t think it’s their job to help you fix it. Instead, you need to rely on your dental coverage to help you reduce the cost of getting your tooth filled by your dentist. But when you have poor or no dental coverage, you may have to pay out of pocket anyway, simply due to waiting periods. Instead of hoping, wishing, and crossing your fingers about medical insurance covering dental care, you might want to consider enrolling in a dental plan through your job, private insurance, or explore your dental office’s different financial options. Here at Alamo Springs Dental, we believe everyone needs the option to receive adequate dental care. Our team is happy to file your paperwork to ensure that you receive the maximum benefits available. We’re in-network with a variety of major insurance plan’s and also have financial plan options. Great dental care is just a phone call away!